mystical force of the moon. 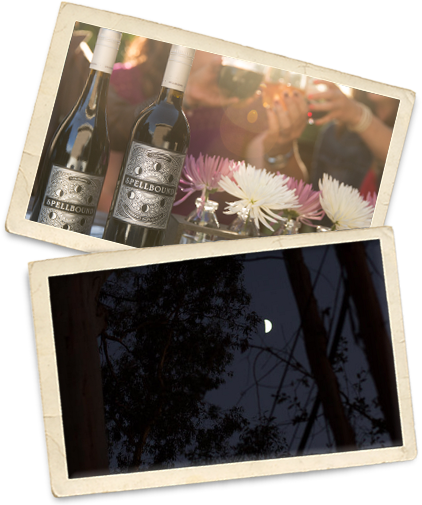 Spellbound wines are sourced from throughout the winegrowing regions of California. As we craft these wines, we take inspiration from the celestial spirit of the lunar calendar, which reminds us that all life's phases are worth remembering. These wines pair with everything from oysters on the barbecue to Wednesday night mac-n-cheese. Share them with all the people in your life - family, newfound friends, or those you've known for many moons. For as long as anyone can remember, man has marked time by the movement of the moon through its phases. From full, glowing orb to gentle crescent, this spellbinding ruler of the night sky inspires everyone from poets to winemakers. There’s nothing like a glimpse of this ever-present sphere to make one pause in appreciation, wherever we are, whatever we’re doing. Moments like these inspired us to make Spellbound, wines that bring people together and reveal the beauty in the day-to-day.